These cards are so cute. I love the yeti pulling Santa. Thank you for sharing. Great cards ! This yeti is so cool ! What an awesome accomplishment- your stamp set is adorable. Great card, I love when the sets are interchangeable like this! Great cards, love the falling circles in the background, great new set from N&T! Great cards, love the falling circle background, great new release from N & T! Congrats on the adorable Get Yeti set! I love the cute Yeti and his pals! Darling cards with awesome coloring! Oh Elena this stamp set is beyond adorable!! Thank you :) so cute the Yetti pulling the Santa!! Very cute scene. I can't wait to get it!! Your cards are so cute! I love how you combined sets for the Yeti to pull Santa on his sleigh! Great job on both cards! Elena, you have done it again!!! 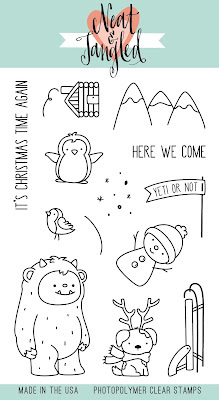 Another totally adorable stamp set!!! LOVE it! So super duper cute! Love your adorable cards, both card designs are fabulous! That is so cute. Father Christmas looks a bit surprised to get ride on the sled. Your cards are so cute! I love the little dog from this set. Very cute scenes you created. 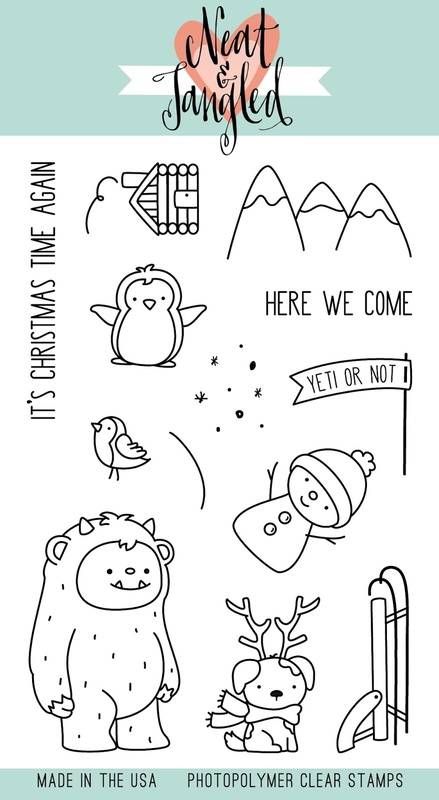 I like how the Yeti is pulling Santa on the sled. Great job on this set. Both cards are wonderful. I especially love the second one because that little dog with antlers is so adorable. This yeti is super cute! And I love the dog with antlers! I love your cards and especially this stamp group. It will be in my cart! The yetti is so cute. Want to give him a big hug. Such a cute set and your cards are adorable! Love the dog with the antlers! Both of your cards are beyond amazing. I love all the white with the super dark background in the first card and than the second you went completely different with just all white. Both were done perfectly and show the stamp set off great! Gorgeous cards! Love that yeti! Adorable projects! This set is just too cute! Awww!!! I love this adorable Yeti and all the other cutie critters!!! Congrats on your new AWESOME stamp set!!! Your cards are totally sweet!!! Fantastic cards! I love the mountains and the cute little cabin! Congratulations for this adorable set ! Love your two cute scenes, you really made a fabulous work to give them life ! Thanks for sharing ! Super cute Yeti! Love your illustration style. Adorable scenes on your pretty cards, awesome coloring and love the dog with reindeer antlers too! I like how you pulled from a few different sets to make great cards. This yeti set is FAN-tastic in each of your cards. Quite inspiring for having a whimsical holiday. Such an adorable Yeti and love the scenes you created. Great job on these fun scenes!